Molasses has a distinctive, amazing flavor, unlike anything else in the world, and it’s perfect in this simple and easy holiday treat. The aroma while baking is nothing short of dreamy! Molasses is a by-product of the sugar making process and is touted to have some health benefits. While it is a sweetener made from sugar, it’s also full of minerals and some vitamins. It’s uniquely wonderful flavor reminds me a licorice, and has been a favorite syrup since I was a kid. Molasses comes in three varieties: sulphured, un-sulphured and blackstrap. 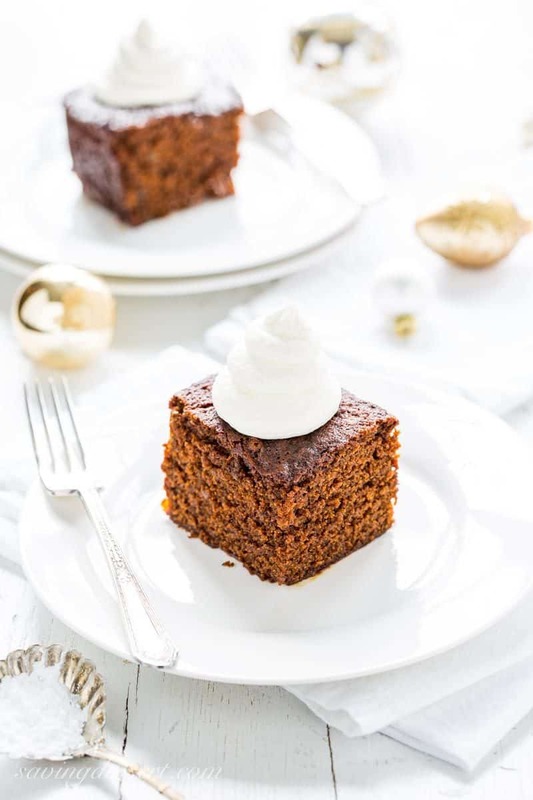 This Gingerbread Cake recipe is made using un-sulphured molasses which is easy to find in the baking aisle of your favorite grocery store. 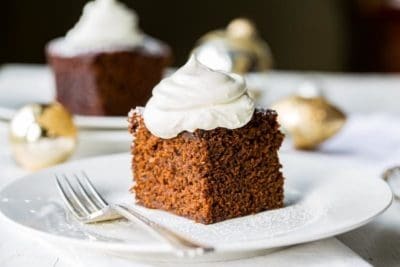 Since Gingerbread Cake is not as rich as many desserts, it holds up well with a sweet topping. Simply dusted with powdered sugar or served with a dollop of sweetened cream, this simple and delicious cake will be an instant holiday favorite. 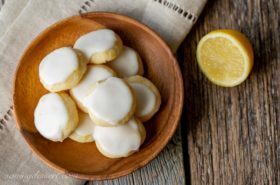 We love the combination of lemon and gingerbread so I whipped up a batch of Lemon Cream to dollop on top. With the addition of a small amount of cream cheese, this lemon cream is more stable than plain whipped cream and will last a day or two refrigerated in a sealed container. That makes it easy to make-ahead, and super easy to serve to your holiday guests. Finally, if you love the gingerbread/lemon combination too, you’ll want to check out this impressive Gingerbread Roll with Lemon Cream Cheese Filling and these wonderful little Gingerbread Whoopie Pies too! And, don’t miss these cute Gingerbread Cupcakes topped with a little gingerbread cookie – great for office parties and large get-togethers. 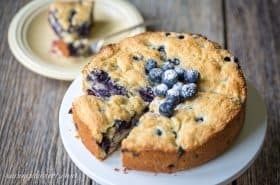 I’ve made this easy recipe many times, and even tried baking the cake in different sized pans. While I love a big, tall piece of Gingerbread, baking in a 9×9-inch pan will produce a much drier cake. It takes a long time to get the middle fully baked when it’s that thick, which can lead to dark brown, hard, dry edges. The edges will soften a bit once cooled so if you’re set on a 9×9-inch cake, be sure to bake it at a lower 325 degree temperature. The best way to make this cake is to use a 13×9-inch pan and bake at 350 degrees. 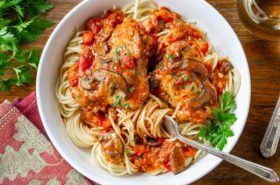 This is a vintage recipe adapted from an old newspaper article, but it’s very similar to many recipes available on-line today. We’ve tweaked the recipe a little here and there, and added crystalized/candied ginger to the batter before baking. With loads of ginger and molasses, and topped with a bright lemon cream, we are in holiday heaven! Preheat oven to 350 degrees. Lightly spray or grease a 13x9-inch baking pan. Line the bottom with parchment paper, and spray or grease the parchment. Set aside. In a 2-cup measuring cup with a spout, whisk together the molasses and hot water. Whisk in the vanilla extract. Set aside. Sift together the flour, baking soda, cloves, cinnamon, ginger and salt. Set aside. In a large mixing bowl, beat together the butter and sugar with an electric mixer until blended. Alternate adding the flour mixture with the molasses, starting and ending with the flour. Blend after each addition. Scrape the bottom and sides of the bowl with a rubber spatula making sure the mixture is well blended. At first the batter may look like it's separated but it will come together once all the flour is added. Fold in the crystalized ginger with a spatula and pour the batter into the prepared pan. Bake for 25-30 minutes or until a toothpick inserted into the center comes out with no wet batter attached. 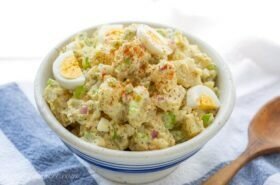 Cool and serve topped with lemon cream if desired. In a small mixing bowl, combine the cream cheese, powdered sugar and lemon juice. Blend with an electric mixer until smooth and creamy. With the mixer on low, slowly add the whipping cream until it’s incorporated and starting to thicken. Increase the speed to medium, then high, and beat until medium peaks form. This happens fast so don’t walk away. Serve immediately or refrigerate until needed. Still looking for more? We have a wonderful roundup of 23 Gingerbread Recipes and some delightful, classic Gingerbread Cookies too. 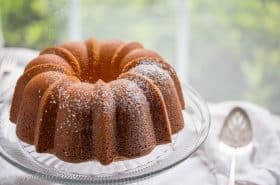 Don’t miss this absolutely gorgeous Glazed Gingerbread Bundt Cake from The View from Great Island and these lovely Gingerbread Biscotti from She Wears Many Hats. For a fun twist on a delicious candy, check out this creative Easy Gingerbread Fudge from Spend with Pennies. Happy baking friends! Your gingerbread cake looks wonderful and the lemon cream makes it a special treat. Pinned! Thanks Gerlinde – it is always a welcome treat on our table. Hope you’re enjoying your holiday! Thank you Shannon – the lemon gingerbread combo is a favorite of mine. Hope you and your family have a blessed Christmas! I love gingerbread flavor this time of year. I make cookies a lot, but I may just have to expand my horizons with this cake! It’s so easy Melissa, I’ve made it three times already this season 🙂 Good thing we have little elves to help us gobble it up! My mom used to make a gingerbread cake like this all the time, and I loved it. Gingerbread is the best holiday flavor ~ pinning and sharing! A couple of weeks ago, I baked a loaf of chocolate chip gingerbread to enjoy with my fellas. 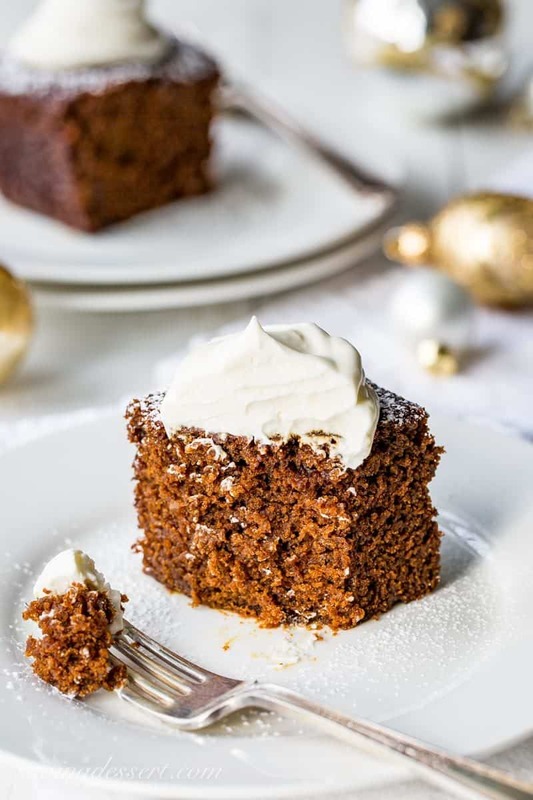 It was just what I’d been craving…and it got me thinking about trying a classic simple gingerbread recipe, just like this one! So this is just what I was looking for. : ) It looks wonderful and that lemon cream sounds like a great pairing. I really do love some sugar & spice this time of year. Enjoy a big slice for me! Love the addition of chocolate to the gingerbread – and I bet your guys loved it. The lemon gingerbread combo is a favorite of mine. Thanks Monica! LOVE warm gingerbread – such a treat Jennifer. Thank you! This does look like gingerbread heaven, for sure! I love the tender looking texture of this cake and that lemon cream sounds amazing. I baked a gingerbread loaf yesterday too. It was delicious even without icing, but you have me at that lemon cream! Now I have to bake one more with frosting! I love that this topping is not very sweet but the lemon really shines through. Great time of year for gingerbread and I bet your loaf is gorgeous Angie.